Strengths, Weaknesses, Opportunities, and Threats involved in a project or in a business venture. If you want to try it out without entering your email address, please use our public SWOT Analysis Canvas Demo for a first impression. 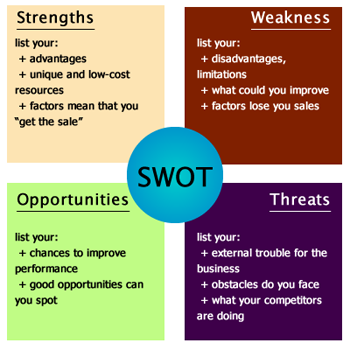 SWOT Analysis is an acronym for Strengths, Weaknesses, Opportunities and Threats. This is a powerful strategic management and planning tool. It is a superb masterpiece which every organization needs to get through to greater heights of success. The Strengths (S) and Weaknesses (W) are normally considered as internal factors of the organization that you can control while Opportunities (O) and Threats (T) are external factors over which you have absolutely no influence or control. Strengths are the individual qualities that help the firm to achieve its objectives. These strengths could be tangible or intangible and through them you can have continued success in the firm. Most of them lie in what the employees possess and include process capabilities, competency levels, products and services, brand loyalty, financial resources and customer goodwill. The organizational strengths may include a broad product line, committed employees, absence of debt and adequate financial resources. Weaknesses are very qualities that the firm from achieving our objectives or our potential to the fullest. They fall below the line of standards we want. They include insufficient research and development for the firm’s products and services, a depreciating set of machinery, poor decision making and a narrow product range. However, the good news about weaknesses is that they can be controlled, minimized or eliminated totally altogether. Organizational weaknesses include wastage of raw materials, high employee turnover and huge debts. Opportunities are the avenues for improvement and success which present themselves in the business environment. Once recognized and acted upon, the organization can gain a competitive advantage over its competitors. The firm should always be on the lookout to avoid failing to recognize them. Business opportunities may arise as a result of competition, from the market, the nature of the industry and the government. Threats arise when the efforts of the firm to attain a high level of profitability and reliability are jeopardized. They normally put the survival and stability of the firm to test and they are often incontrollable. They can be seen when there are excessive price wars in the industry, constantly changing prices, unfavorable laws and regulations, cutthroat competition, constantly changing technology and a lot of undue unrest among the firm’s employees.